In a previous post we discussed using the AWS Service Broker on Kubernetes. A lot has changed since then: EKS is now available, and the Service Broker has evolved significantly, so we thought it would be good to revisit the topic with a focus on EKS. If you are a Kubernetes user, you may have found, as we did, that managing the lifecycle and credentials for disparate services such as databases can be challenging. Aside from having to work out how to provide your application access to needed credentials, it often involves linking multiple disparate tool chains, which adds undifferentiated heavy lifting. This can result in best practices such as least-privilege models being hard to enforce, often being left up to individual development teams to implement. In this post, we will discuss some patterns that help address these challenges. We’ll take a look at Kubernetes Service Catalog, an extension API that enables applications running in Kubernetes clusters to easily use external-managed software offerings, by consuming service brokers that implement the Open Service Broker API specification. 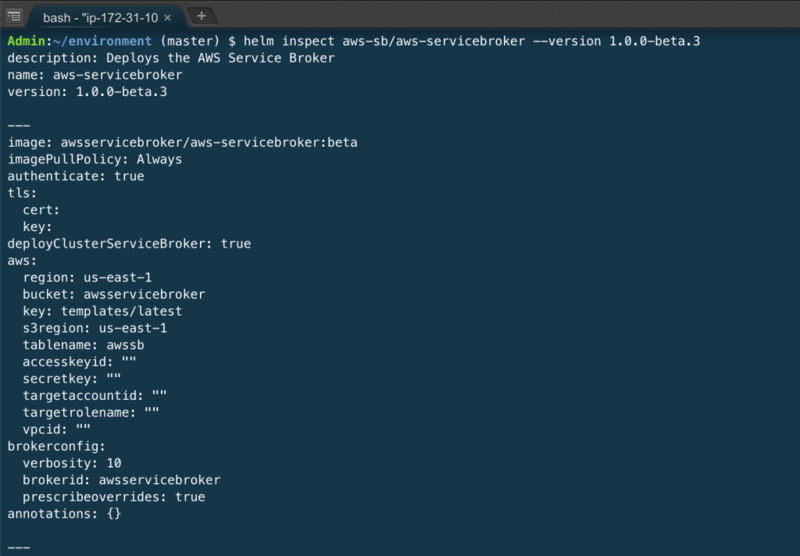 The AWS Service Broker is an open source project that (in combination with Kubernetes Service Catalog) provides a catalog of AWS services that can be managed and connected to your Kubernetes applications using familiar Kubernetes APIs and tooling. We’ll also walk through what using the AWS Service Broker looks like in practice, by provisioning an S3 bucket and connecting it to your application. First, we want to go over some of the key concepts that we’ll be using in this post. For more details, have a look at the Open Service Broker API Specification and Kubernetes Service Catalog design documentation. ClusterServiceClass – A Kubernetes resource that Service Catalog generates. Service Catalog fetches the catalog of each installed broker and merges the new catalog entries into ClusterServiceClasses in Kubernetes. In the case of the AWS broker, these classes represent AWS services like S3, SQS, etc. ClusterServicePlan – Each ClusterServiceClass contains one or more plans. A plan represents a configuration of the service; in the AWS broker, many services have opinionated plans for production and development use cases, as well as custom plans that allow the user to configure all of the available options for the service. ServiceInstance – An instance of a ClusterServicePlan. 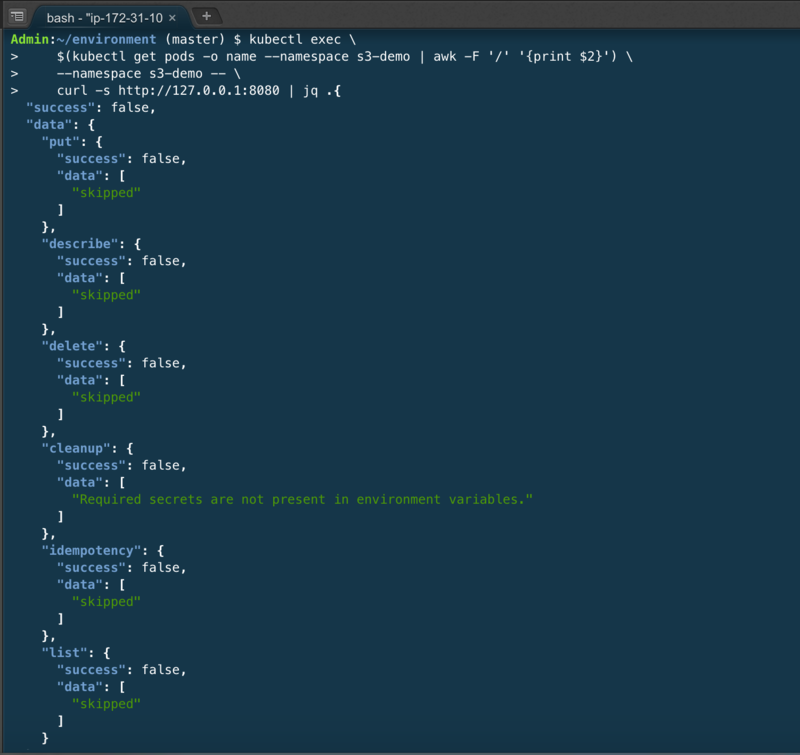 With the AWS broker, this will represent an instance of the AWS service created when the provision API is called. Provision – The provision API is what gets called when creating a new ServiceInstance using kubectl, the api or svcat (the Kubernetes Service Catalog CLI tool). In the case of the AWS Service Broker, the provision call accepts various parameters depending on the plan, which are then used to create the requested AWS services. 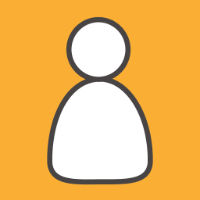 Bind – Binding is the API call that requests credentials and metadata from the broker for a given ServiceInstance. The Service Catalog then creates a Kubernetes secret and stores the credentials in it. Applications can then map the secret to gain access to the credentials. For example, with an Amazon RDS database, the bind call returns the endpoint url, a username and a password. For services that require IAM at run time, a least-privilege policy is created and attached to an IAM user/role. An EKS cluster with at least one node configured; three or more nodes are recommended for HA/production use. For details, see the EKS Getting Started Guide. The steps in this guide should work for any Kubernetes cluster (v1.10 and up), but your mileage may vary. kubectl and aws-iam-authenticator installed/configured to connect to the above cluster. For details see the reference. awscli installed and configured with AWS credentials. For details, see the AWS CLI documentation. We’ll use Helm to handle the installation of the needed components. NOTE: This type of Tiller installation is not recommended for public-facing or production clusters. To learn more about installing Tiller in production clusters, see Securing your Helm Installation. Now that we have Helm and Tiller set up, we can move on to using Helm to install Kubernetes Service Catalog. The first step is to set up the prerequisites. This can be done easily using a CloudFormation template that creates the required IAM User and DynamoDB table. The following code block uses the AWS CLI to launch the template and gather the needed outputs. Be sure to set the REGION variable to the AWS region where you would like to have the broker provision resources. Let’s take the broker for a spin by creating a sample application, provisioning an S3 bucket, and binding the bucket to our application. In this post, we’ve highlighted the power of using Kubernetes Service Catalog and the AWS Service Broker to manage your AWS services, providing separation of code and configuration, as well as providing baked-in best practices like least-privilege IAM. This is just the tip of the iceberg in terms of the functionality provided by the broker! For more advanced scenarios such multi-account provisioning, building your own custom catalog with CloudFormation templates, and using bind to attach to pod-level IAM roles, see the AWS Service Broker documentation. 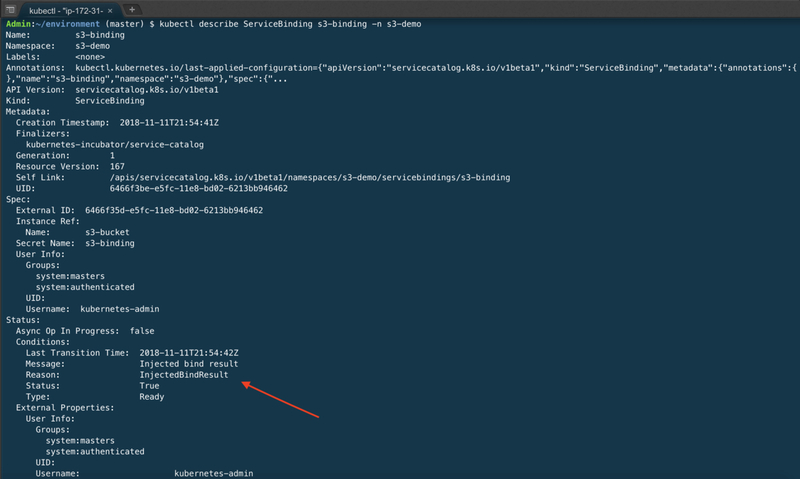 If you’re interested in exploring other ways to integrate AWS services with Kubernetes, we recommend that you also take a look at Chris Hein’s post on the AWS Service Operator. Jay McConnell is a Solutions Architect or the Amazon Partner Network where he specializes in building best practice deployments for partner products on AWS, and in his spare time he maintains as many open source projects as time allows. Srinivas Reddy Cheruku is a Cloud Support Engineer at AWS since 2018. He specializes in containers (ECS & EKS), and is passionate about helping customers implement best practices in DevOps. In his free time, he likes to exercise and study startup stories.